Allelulia! Christian Owners of Hobby Lobby Stores Win U. S. Supreme Court Case Against Obamacare Contraception Mandate | It's the Women, Not the Men! Everyone should say a prayer of thanks for the positive outcome of today’s U. S. Supreme Court ruling for Hobby Lobby. As you may expect, the flaming radical, second-wave feminist and Jewish, Justice Ruth Bader Ginsburg had a hissy fit, writing a 19 page dissenting opinion that went on at length about how this was a setback for WOMEN! Once again, this liberated woman proves that she cares nothing for religious freedom NOR does she care for the babies aborted by the abortifacient drugs Obamacare mandated be distributed by all employers under penalty of millions of dollars of fines. Hobby Lobby alone faced a $1.3 MILLION dollar fine per DAY if they did not comply with the mandate. The decision was 5-4. Joining Ginsburg in her dissent was another Jewish, radical, second-wave feminist, Elena Kagan; another radical, second-wave feminist female, Catholic, Sonia Sotomayor and the always wacky liberal leftist and Jewish, Stephen Breyer. Our male heroes, as usual, who are all Catholic, were Justices Antonin Scalia, Clarence Thomas, John Roberts and Sam Alito. 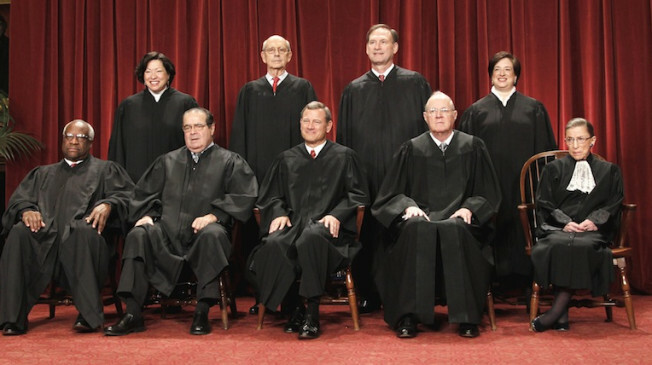 Justice Anthony Kennedy, who is also a Catholic, is inevitably the swing vote. This time he swung the right way, joining the other men. Thank you Dear Lord for guiding these faithful men in their decision to uphold the religious liberty upon which America was founded, and by which, America has become the greatest, and kindest, country on earth.